Her research turned up an orthopaedic surgeon who was an active cyclist – Dr. Stephen Duncan. When Lane arrived in Lexington for her appointment with Duncan, the options she received from him were “day and night” compared to what she’d heard originally. “He told me he’d have me active again and gave me a variety of options I hadn’t been told about earlier," Lane said. Duncan recommended a total hip arthroplasty (THA) in which the traditional procedure entails removing the femoral head (the round top of the hip bone) and shaving off the cartilage inside the socket, a titanium shell is then placed into the socket and a titanium stem is fitted inside the thigh bone. Finally, a plastic liner is placed inside the socket and a ceramic head on the femoral component. With a traditional THA doctors discourage high impact activities as they increase the risk of fracturing and early wear. Duncan utilized a newer technology for Lane called Dual Mobility, which uses a metal liner and two moving heads (an inner Oxinium head and an outer plastic head). This allowed for lower wear and decreased the risk of implant fracture. He also used a stem in her femur that had a special coating that would create a “biologic” fixation between her femur bone and the implant, which would prevent weakening of the bone in her femur around the stem and also avoid any pain in the femur that might be experienced with running. After six months of recovery Lane was back on her feet winning her age group in a sprint-distance triathlon (half mile swim, 12.4 mile bike, 3.1 mile run). Since her surgery, Lane has competed in over 20 races including the New York City Marathon, an ultra-marathon and multiple triathlons of varying distances. 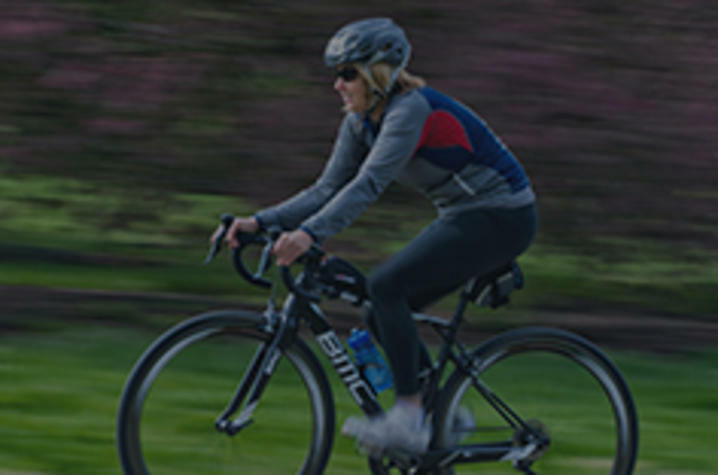 Lane noticed early on that there was little information available about what it was like to return to endurance sports after a hip replacement or a surgery like hers. The few articles she was able to find provided conflicting information or gave advice she didn’t feel was right. She’d read that you’re not the same athlete after hip surgery and it would negatively affect her times while others shared how surgery had helped relieve stiffness and pain and led to better race results. If Lane had listened to her first surgeon she said, “I’d be done.” Duncan’s support and second opinion meant she could continue doing what she loved, being active and staying healthy. “Get a second opinion and find a doctor who is familiar with the sports discipline you’re interested in,” she said. If Lane hadn’t followed the advice of her son’s coach, she wouldn’t have been able to travel to Cozumel to compete as a member of Team USA. Thanks to hard work and an unwillingness to give up, she will have the opportunity to compete in a duathlon (run, bike, run) in Canada this September. She has no limits on when she’ll have to stop competing and is excited to continue to compete (and win) races all over the world.